I am thankfully back to blogging as my family and I were so lucky in this horrific storm unfortunately named after me! We never lost power, although the lights were flickering a lot the night of the hurricane and we surely thought we would. My basement floods during a regular rain storm but thankfully in this storm we didn’t have much rain, maybe a half inch. Millions lost power which will eventually be restored and their lives will go on but so many actually lost their homes and possessions as the storm ripped the houses off their foundations right into the sea. Parts of NYC, New Jersey and Long Island are a horrific nightmare. We are not used to these hurricanes up here in NYC and the Northeast. Sure we have had many blizzards, but very few hurricanes. My heart goes out to the people who lost everything. Please, whoever reads this post, please give whatever you can to the Red Cross to help the victims of Hurricane Sandy. Whatever you can give, even if it is only a dollar, it will help. If you can donate clothing, non-perishable food, anything, it would be greatly appreciated! Thank you so very much for reading this! Now on to my recipe! This recipe was adapted from my favorite Weight Watchers recipe sites, Skinny Taste. Gina has the most wonderful recipes, if you are on Weight Watchers. I didn’t have all the ingredients so I improvised and it was still delicious. I paired the chicken with vegetable rice pilaf, roasted vegetables and roasted leftover spinach mixture. The filling is very similar to a spinach pie, it was delicious! In a non stick saute pan, heat the oil. Add onions, garlic and scallions and sauté about 1 minute. Add spinach and parsley, salt and pepper and cook another minute. Remove from heat and let cool. Place about 2 tbsp. 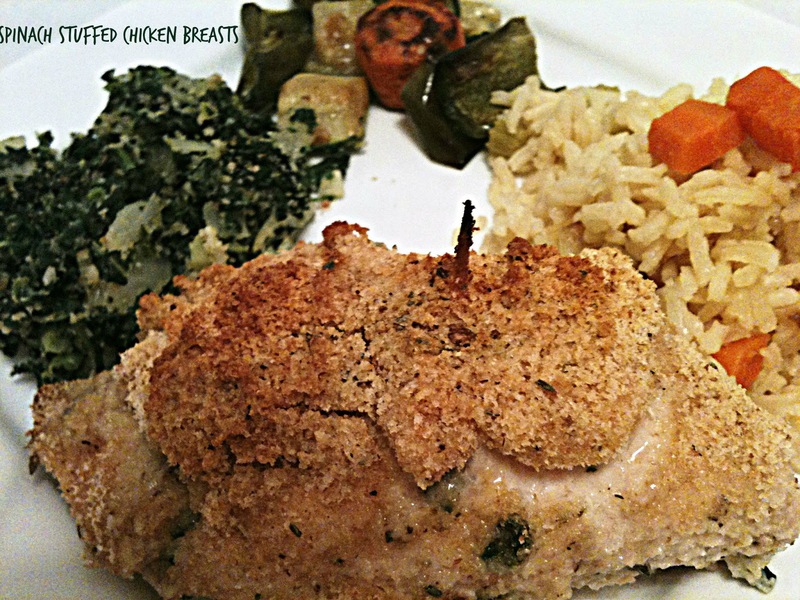 of the spinach mixture in the center of the chicken cutlet. Roll it and secure the ends with toothpicks. Dip chicken into egg mixture, and then the breadcrumbs. Spray cookie sheet with the cooking spray and place chicken onto the sheet. Spray chicken with cooking spray and bake about 25 minutes or until cooked through. Remove toothpicks and serve. I love stuffed chicken breasts and am also digging out some great WW recpes heading in to the holidays. This one sounds yummy!